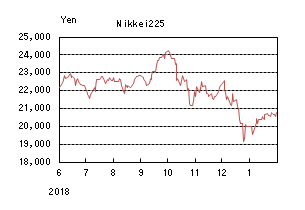 In March, the Nikkei Stock Average fell 0.84 percent as stock markets in March saw rising expectations for progress in the US-China trade talks, as well as concerns over the slowing of the global economy. At the beginning of the month, the stock market began rising with expectations for the progress of the US-China trade talks, but then it fell back as uncertainty about the future of the world economy, such as China, increased. In the middle of the month, the stock market returned as concerns about the US economy receded, as US retail sales exceeded market expectations, and economic stimulus measures announced at the National People's Congress in China were favorable. 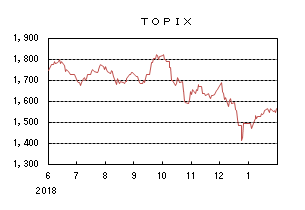 In the end of the month, the stock market fell sharply due to rising concerns about the economic slowdown caused by a reversal of US long and short interest rates etc. And after a sharp fall, the price movement became rough development because of a large rebound from buying with expectation for dividend right payment and its reinvestment. By industrial sector performance, fisheries, agriculture and forestry, real estate, pulp and paper, and shipping were positive, and shipping, rubber, and transport equipment were weak. While the Fed has shown a dovish stance and China's economic stimulus measures are positive factors for the stock price, there is a risk of guidance on the financial results announced from the end of the month in addition to the global economic sentiment becoming severer. In the stock market, the upper side is limited, and the trend in a narrow range is expected. According to trade statistics, Japan's exports have been declining for three consecutive months from December last year to February this year due to a slump to China and so on, and as a result, production activities have become weak. In the monthly economic report in March, the government’s keynote judgment has been lowered for the first time in three years since March 2016 from "gradual recovery" in last month to "gradual recovery with weakness in some of exports and production". As for the outlook, the repot has been revised downward by adding the phrase "remaining weakness remains for a while" while maintaining the phrase "moderate recovery". Under such circumstances, corporate earnings in fiscal 2018, which will be announced from the end of the month, are expected to be decelerating. Financial results for the October-December quarter decreased mainly for companies related to external demand, but the same trend will continue for the January-March quarter. In addition, with regard to the company plan for fiscal 2019, it is highly likely that the current environment will release cautious guidance. Although there are positive factors in the outlook such as China's economic stimulus package being launched, it is expected that recovery will begin in the second half of the year as the global economy decelerates. Meanwhile, the stock market has bottomed out last December, and has continued to be resilient since then. The good demand for supply and demand can be expected due to the tendency of foreign investors to buy back in April. However, in addition to the guidance risk in the financial results announcement, due to uncertainty factors such as the future of TAG negotiations with the United States, it is thought that the market will continue to face heavy market prices.